NVIDIA's GT200 GPU has a significant increase in computational power thanks to its 240 streaming processors, up from 128 in the previous G80 design. As a result, NVIDIA's GT200 GPU showcases a tremendous increase in transistor count over its previous generation architecture (1.4 billion up from 686 million in G80). 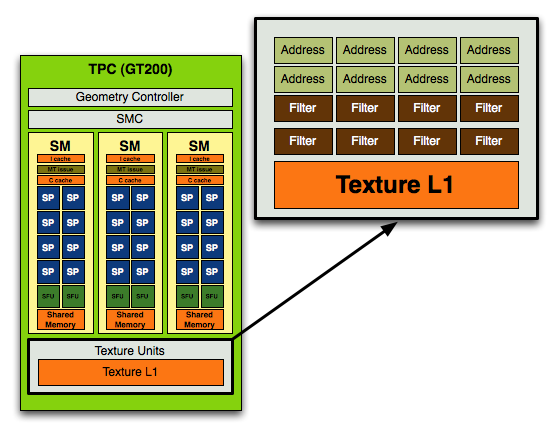 The increase in compute power of GT200 is not mirrored however in the increase in texture processing power. 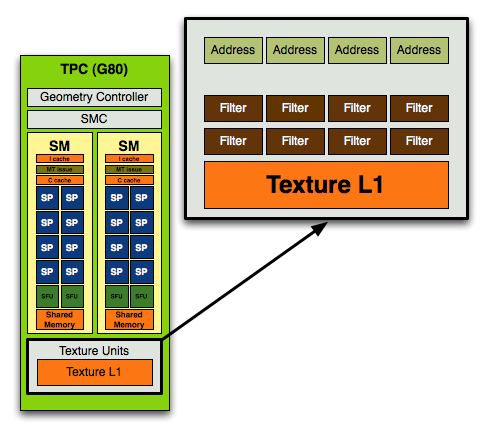 On the previous page we outlined how the Texture/Processing Clusters went from two Shader Multiprocessors to three, and how there are now a total of ten TPCs in the chip up from 8 in the GeForce 8800 GTX. In each block you had 4 texture address units and 8 texture filtering units. In the previous designs you'd have 8 address and 8 filtering units per TPC (or 16 streaming processors), in the GT200 you have the same 8 address and 8 filtering units but for a larger TPC with 24 SPs. For a 87.5% increase in compute, there's a mere 25% increase in texture processing power. This ratio echoes what NVIDIA has been preaching for years: that games are running more complex shaders and are not as bound by texture processing as they were in years prior. If this wasn't true then we'd see a closer to 25% increase in performance of GT200 over G80 at the same clock rather than something much greater. It also means that GT200's performance advantage over G80 or G92 based architectures (e.g. GeForce 9800 GTX) will be determined much by how computationally bound the games we're testing are. The ratio of increase compute/texture power in the GT200 has been evident in NVIDIA architectures for years now, dating back to the ill-fated GeForce FX. NVIDIA sacrificed memory bandwidth on the GeForce FX, equipping it with a narrow 128-bit memory bus (compared to ATI's 256-bit interface on the Radeon 9700 Pro) and instead focused on building a much more powerful compute engine. Unfortunately, the bet was the wrong one to make at the time and the GeForce FX was hardly competitive (for more reasons than just a lack of memory bandwidth), but today we're dealing in a very different world. Complex shader programs run on each pixel on the screen and there's a definite need for more compute power in today's GPUs. 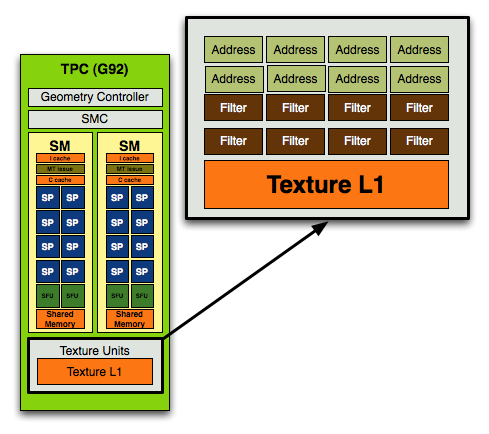 In addition to the 25% increase in texture processing capabilities of the GT200, NVIDIA added two more ROP partitions to the GPU. While the GeForce 8800 GTX had six ROP partitions, each capable of outputting a maximum of 4 pixels per clock, the GT200 adds two more partitions. With eight ROP partitions the GT200 can now output a maximum of 32 pixels per clock, up from 24 pixels per clock in the GeForce 8800 GTX and 9800 GTX. The pixel blend rate on G80/G92 was half-speed, meaning that while you could output 24 pixels per clock, you could only blend 12 pixels per clock. Thanks to the 65nm shrink and redesign, GT200 can now output and blend pixels at full speed - that's 32 pixels per clock for each. The end result is a non-linear performance improvement in everything from anti-aliasing and fire effects to shadows on GT200. It's an evolutionary change, but that really does sum up many of the enhancements of GT200 over G80/G92.